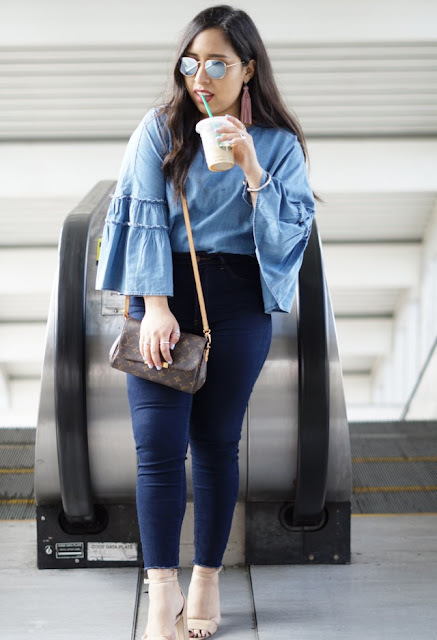 Today I am sharing all about my jean on jean outfit I featured on my Instagram yesterday. I purchased both top and bottom from Zara. My top was initially going to go with me to Coachella (and it still might) but I was feeling it Sunday morning and could not resist. I enjoy wearing high waisted jeans. it most deff keeps everything in. HAA! In case you are not aware, I am petite and struggle with finding jeans that are not "too long" for me. So, I decided to cute these jeans to help me a little. And continue to do so with all of my jeans. I am a little over having to fold them up! I purchased these shoes at Nordstrom. However, my sweet friend found some very similar ones from Charlotte Russe for under $25. They are very cute! I try to save calories when possible (for the fries) and therefore ask for no sweetener. I have gotten use to it and is my go to drink in the AM's. 2. Undertoe (on the secret menu) This is a drink that is to be taken as a shot. It's quick, strong, and to the point. The drink consist of 2 shots of expresso, cream, and vanilla. 3. Green Tea Latte(tall) also known as Matcha Latte. Besides the pretty color, if you are looking for something smooth and creamy this is perfect! Now enjoy this outfit, grab your coffee and kick Monday's bootayyy! Thank you so much for stopping by. I la la love you! So beautiful! I want the green tea latte so much!